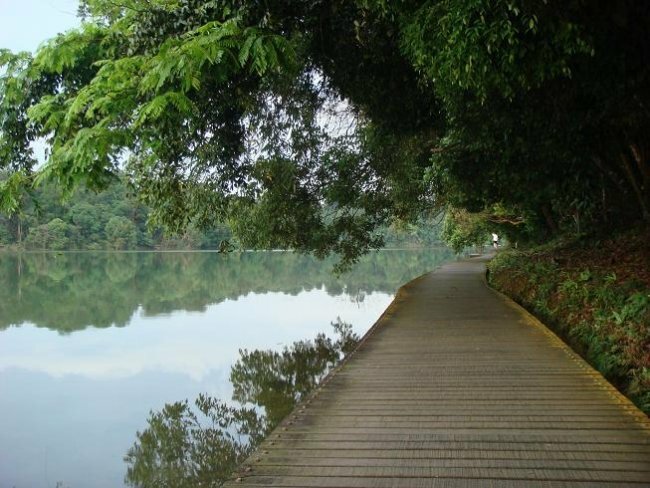 MacRitchie Reservoir is Singapore’s oldest reservoir. The reservoir was completed in 1868 by impounding water from an earth embankment, and was then known as the Impounding Reservoir or Thomson Reservoir. 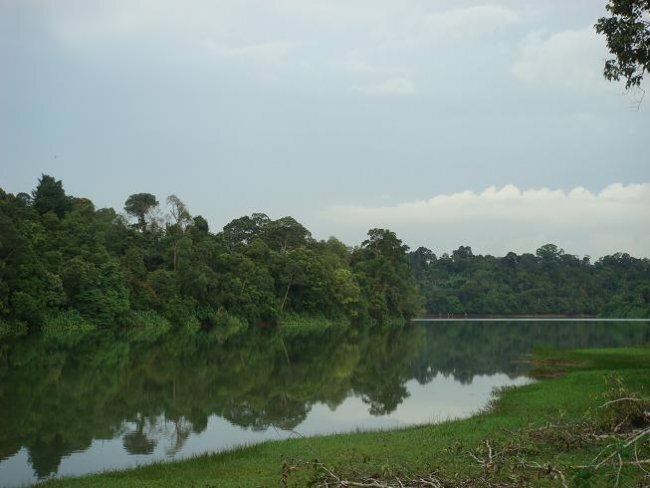 The development of the MacRitchie Reservoir brought the forest devastation around the area to a halt. The forest surrounding the reservoir has been protected as a water catchment reserve. 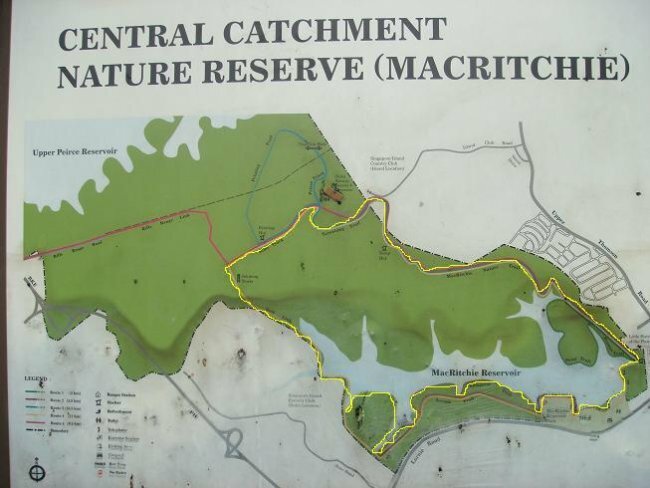 More than one square kilometre of primary forest still flourishes in the Central Catchment Nature Reserve today, particularly around MacRitchie Reservoir. Rubber trees, remnants of the plantations from the 19th century, can still be seen along the fringes around the reservoir. 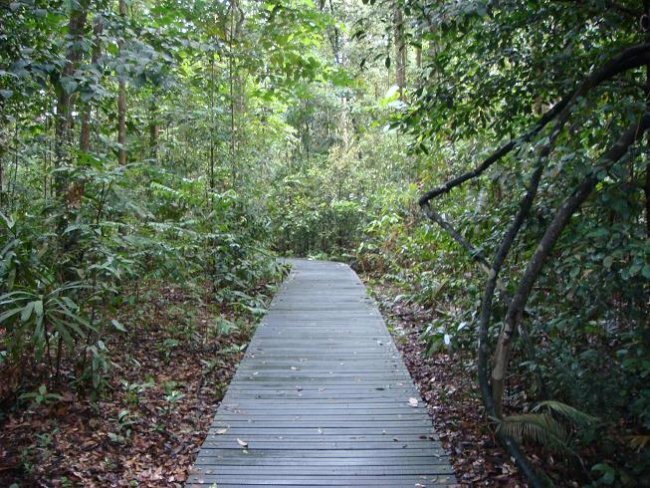 The boardwalk around the perimeter of the MacRitchie Reservoir brings the visitor through interesting secondary forest in the Central Catchment nature area. The boardwalk which hugs the reservoir also allows for easy exploration of freshwater wildlife. Visitors will be enthralled by breathtaking views of the reservoir and the surrounding forests. This is definitively the most beautiful track I ever ran. 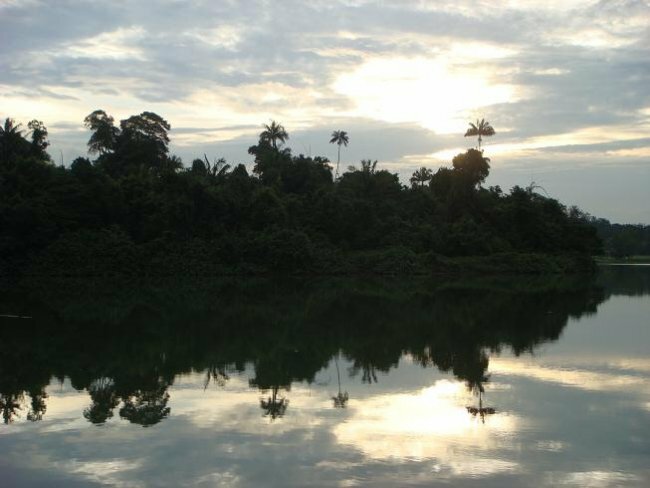 Tropical rain forest, muddy mangroves, a lake bordered by palm trees, a nice Golf Course... the scenery is truly stunning! By public transport: The nearest MRT station is Bishan, from there you have to take a bus. Another possibility is taking a bus (number 162?) from Newton MRT. 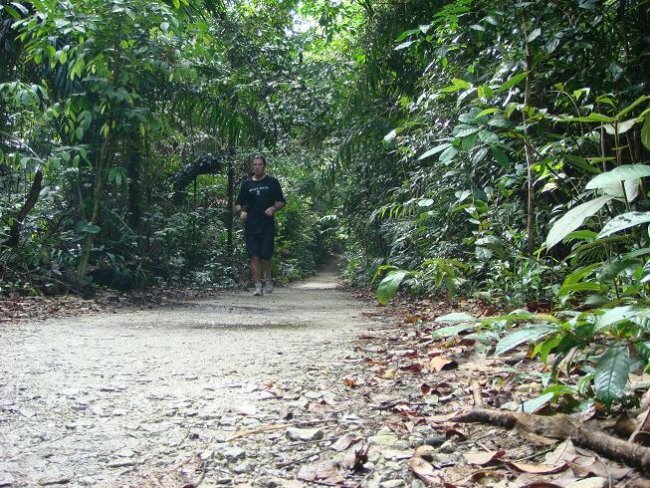 By car: Just head for the MacRitchie reservoir at Upper Thomson Road. There is a free parking lot just at the entrance. The track: Again, difficult to measure a track with Google Earth in a tropical forest. According to the maps and distance markers at the Reservoir, the Yellow Trail is a 11km run. 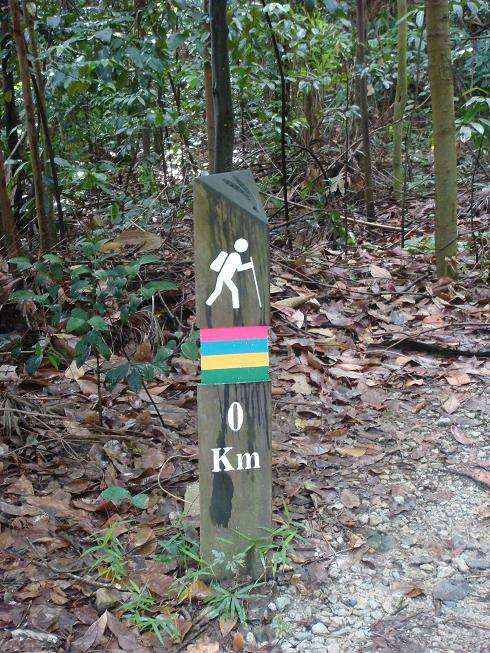 Start near the kayak embarquement and a small trail will lead you for around 3km in the forest. The profile is not flat and the soil can be slippery after one of those heavy rains. After hitting the road, turn left and then left again to follow an asphalted road for a while. Then take a small trail departing on your left hand downwards. 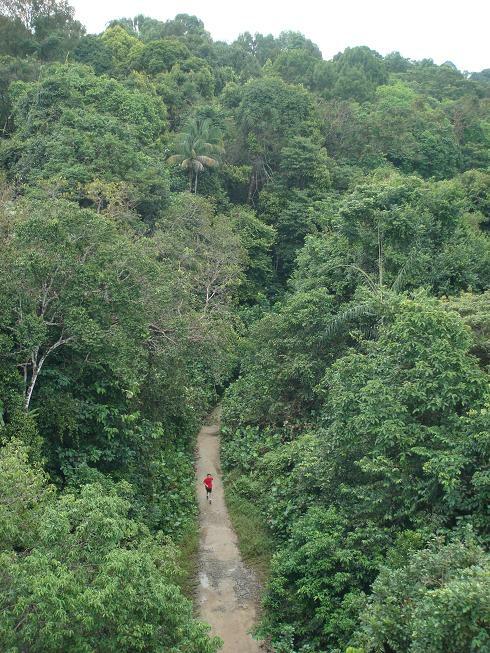 After passing the TreeTop Walk visitor center, follow the signs to the Jelutong Tower. The tracks broadens and after passing the tower, continue left on a surelevated wooden track crossing the muddy forest. After reaching the Golf Course, just follow the border of the MacRitchie Reservoir. Water point: At the departure point there is water, and even public showers and lockers (take 1SGD coin) to keep your stuff there if you don’t come by car. At the TreeTop Walk Visitor center (km 4.5) there is also a water point. Google Maps: MacRitchie Reservoir on Google Maps. I have seen at the websites and I am visiting this park very very shortly, then I will keep posting my comments on it. In advance i feel that this park is far better for those who possess stress and depressions and it is true. Singapore ’My eyes in paradise"
Very interesting article thank you for this information.